The Old Rip Van Winkle Distillery has a four generation history. 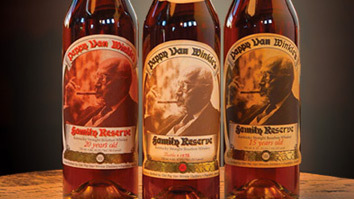 The Van Winkle family’s involvement in the bourbon industry began in the late 1800s with Julian P. “Pappy” Van Winkle, Sr. He was a traveling salesman for the W.L. Weller and Sons wholesale house in Louisville, traveling around the state by horse and buggy. Pappy and a friend, Alex Farnsley, eventually bought the wholesale house and also purchased the A. Ph. Stitzel Distillery, which made bourbon for Weller. They merged the two companies and became the Stitzel-Weller Distillery. Their prominent brands were W.L. Weller, Old Fitzgerald, Rebel Yell, and Cabin Still. In May of 1935 at the age of 61, Pappy opened the newly completed Stitzel-Weller Distillery in South Louisville. He had a heavy influence on the operations there until his death at the age of 91. His son, Julian, Jr. took over operations until he was forced by stockholders to sell the distillery in 1972. The rights to all of their brands were either sold with the distillery or to other distilleries. After selling the distillery, Julian, Jr. resurrected a pre-prohibition label, the only one to which the Van Winkles kept the rights, called Old Rip Van Winkle. He used whiskey stocks from the old distillery to supply his brand. Julian junior’s son, Julian, III took over in 1981 when Julian, Jr. passed away. Julian, III has continued with the Van Winkle tradition of producing the highest quality wheated bourbon available. His son, Preston joined company in 2001 and the Van Winkles look to continue that tradition for generations to come. Recently, the Van Winkles entered into a joint venture with the Buffalo Trace Distillery in Frankfort, KY. All of the Van Winkle’s whiskey production now takes place at Buffalo Trace under the same strict guidelines the family has always followed in order to produce a superior quality product. Aside from the rich family history, Van Winkle bourbons are special for another important reason, their recipe. All of the Van Winkle bourbons are made with corn, wheat, and, barley instead of corn, rye and, barley. This “wheated” recipe gives the bourbon a much softer, smoother taste and it also allows the whiskey to age more gracefully.